Maggie Lopez with Gary McKee. Maggie Lopez is one of those gifted people who see junk and figures out a way to turn it into treasure. She’s also one of those lucky people who were able to turn a passion into a full-time job, from software programmer to artist. Just about every weekend, you can find Maggie at an antiques show or arts and crafts fair selling her latest creations in The Veranda booth. You can also find her work in the polkabeat.com store with the unique spoon necklaces featuring polka sayings. 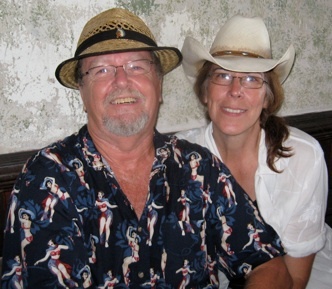 I first met Maggie at a polka dance at Sengelmann Hall with the Shiner Hobo Band. Polkabeat photographer Gary McKee had brought her to the dance. “That was the first time I ever went polka dancing. It was the most fun ever. I love the Hobo band. My new favorite dancing is polka dancing. You can dance the polka to songs like Ring of Fire and Smoke on the Water. That’s so cool,” she said. Maggie says she’s always been an eclectic girl. “While others in high school were into modern furniture, I was into antiquing. I was a junker with a VolksWagon bug,” she says. “My grandmother encouraged us to appreciate and actually use stuff like the good china and silverware.” Maggie still has the “cutest piggy bank ever” that her grandmother gave her when she was six years old. Always looking for a different way to present something is how Maggie happened upon creating the spoon necklaces. She would pick up vintage spoons at antique shops thrilled with the different handle patterns. She got the idea to flatten the spoon and make plant markers out of them, writing the names of herbs on them. That idea blossomed into the necklaces. “I made some necklaces with Joy, Gypsy and other sayings and offered them in my booth. They became popular and I started getting orders from shops and jewelry places. Once a lady stopped me in the grocery store and asked to buy the necklace I was wearing.” (Yes, she sold it to her.) Gary encouraged the polka sayings and yours truly has added a few suggestions as well, such as Bohemian Princess, which is my exclusive design! For three days a month, you can find Maggie at her booth in B&T Antiques in Carmine. To give you an idea of her eclectic inspiration, she recently sold a seven-foot galvanized table with a downward slant that had been used for processing meat at some point in its life. She turned it into a dining room table paired with an old bread rack, mirrors, French upholstered chairs and a chandelier. Voila! A most unique dining room.